We were amazed with the amount of unique places to eat in Kansas City, Missouri! Yes, there’s great barbecue. But there’s also SO much more!! In this post, we highlight the yummiest and most fun restaurants in Kansas City. Between two house sits, we planned a quick trip to Kansas City. 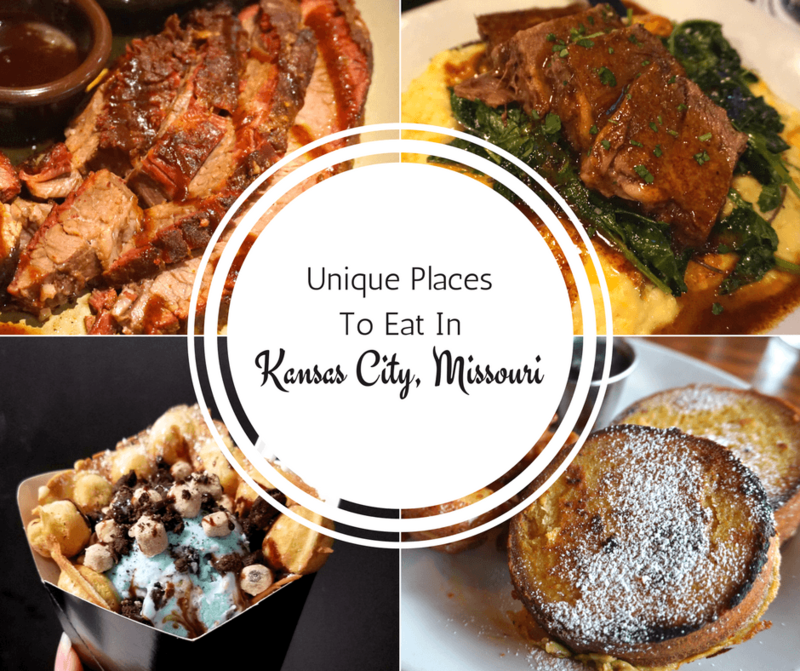 As we researched dining options, we realized that there were so many unique places to eat in Kansas City! With only a few days, we did our best to visit as many as we could. Below is our list of favorite Kansas City restaurants. First things first… when you’re in Kansas City you have to eat barbecue! We did quite a bit of research when we were trying to figure out where to go for our first taste of Kansas City barbecue and the restaurant that kept coming up was Q39. It’s not only considered one of the top restaurants in Kansas City, it’s also considered one of the best places for barbecue. This was actually our first stop when we got in to Kansas City, and our friendly waiter helped us decide on a few plates. We got two appetizers of bacon wrapped shrimp and macaroni and cheese (both of which were delicious!) and for our main dish we got brisket with burnt ends. Now, we’ll be completely honest here and say barbecue isn’t our thing. But this brisket is some of the best we’ve ever had. It was juicy, had incredible flavor, and was so tender you could cut it with your fork. Another one of the best places to eat in Kansas City is Beer Kitchen. We visited this restaurant after a long day of sightseeing, and their food really hit the spot. We also loved their fun and funky decor. To start we had Cheesy Ancho Corn Dip with chipotle white cheddar and blue corn chips. Wow, this dip was amazing! Then we had the BBQ Creekstone Short Rib with cheddar grits and kale. And finally, the Triple Cheese Grilled Cheese with tillamook-aged cheddar, chipotle white cheddar, provolone, avocado and oven-dried tomato on romano-encrusted sourdough. Our mouths are watering just thinking about this meal! The cheddar grits were phenomenal and paired well with the short ribs. And the romano-encrusted sourdough of the grilled cheese… heavenly! We savored every bite! If you’re looking for the best brunch in Kansas City, then The Corner Restaurant is for you! This locally owned eatery serves brunch seven days a week! During our visit, we ordered an Eggs Benedict. It consisted of two large English muffins, two poached eggs, tomato stewed collard greens, hollandaise, and house made chorizo. We weren’t crazy about the collard greens, but everything else was delicious! A contender for best breakfast in Kansas City is Room 39. They use seasonal ingredients sourced from local producers, and their menu is constantly changing. We ordered the Brioche French Toast, which had two brioche slices battered in cinnamon-egg custard and was served with bacon and potatoes. We’d never had French Toast with brioche bread before, so we really enjoyed having this dish! We fell in love with Messenger Coffee Company and think it’s truly one of the most unique places to eat in Kansas City. This multi-floor space serves quality coffee and pastries, all made there in front of customers! We loved how open it was, and thought the stairs were really cool. They even have a rooftop area with an outdoor fireplace! Seeing (and smelling) the coffee being roasted only added to the experience. There’s also an area where you can see bread and pastries being made. All from your table! If you’d rather a more quiet spot to read, however, you can head to the penthouse level which has extra seating. For those with a sweet tooth, we recommend Doughnut Lounge. They have the best doughnuts in Kansas City! They have classic doughnuts, but also creative combinations like maple bacon doughnuts and biscuits and gravy doughnuts. We chose the Oreo stuffed doughnut, which had an actual Oreo stuffed inside of it and was topped with vanilla icing and Oreo crumbles. It was amazing! Another one of the most unique places to eat in Kansas City is The Waffle Bar. Their most popular creation is the Bubble Waffle, a made to order waffle that is rolled into a cone shape and filled with ice cream. You choose the ice cream flavor and add whatever toppings and drizzles you want. The combinations are endless and the final creation makes for great Instagram photos! The Waffle Bar is a unique and fun shop! The amount of flavorful and mouthwatering food in Kansas City really surprised us. We knew that Kansas City was known for amazing barbecue, but seriously… we had no idea that we’d eat SO well during our short trip. We’d go back just for that grilled cheese alone! So if you love great food, we definitely recommend a visit to Kansas City. OMG!!! Such good food in KC! Can’t wait to go back. Great article – glad you enjoyed our town – you mentioned some places I have never tried – they are on my list now! Everything looks super yummy! Now I wanna go just for the food! oh, food sounds like so delicious! Thank you for sharing this post really great and wonderful article. You are talking about food in Kansas city. How would you rate Kansas City for vegetarians? I usually find most western cities too heavy on non-vegetarian or sugary food. Umm YUM!!! That beef brisket is making my mouth water right now, and since I’m reading this over breakfast I wish I had some of that brioche french toast! Never been to Kansas City but I would love some BBQ myself! That Angus Beef brisket looks delish. Too bad that and the oreo stuffed donut aren’t sold in the same resto! I had no idea that Kansas City had this much great food! I’m particularly lusting after the certified Angus beef brisket, but the Bubble Waffle… WOW! Yum, Yum Yum! Just drooling over my keyboard as Im typing this. The bubble waffle looks so good! And who doesn’t love a delicious eggs benedict. If I could eat eggs benedict everyday, I would be so happy! Some great looking food. Like the sound of the Beer Kitchen and anywhere called the Doughnut Lounge is a place we definitely need to visit. Mmmmmm…doughnuts!! This article is so helpful for us! We are in Arkansas right now and will be heading into Missouri in the next few weeks. Finding a great place to eat is one of the tricky things about traveling all the time. The Beer Kitchen sounds so good, my mouth watered the entire time I read the descriptions. Our youngest will want us to visit Room 39 though because he loves going out for breakfast and since it is the best in town, we will have to try it! Some amazing food variety there. Though not a beef taker other options look delicious to me. This post is making me hungry and salivating while reading this entire entry! Oh gosh, I really need to get some delicious food now. Great eats! I never knew Kansas would be such a food haven! I wish to go here too! OMG! It look so delicious food.. There are so many delicious variety in Kansas city. Thank you so much for sharing about the Kansas food! Q39 is my favorite too, their leather menu covers offers the best beef dishes. One VERY UNIQUE AND CHARMING restaurant is anout 9 miles outside of KC…it’s Cafe Di’ Amis in Parkville, Mo. Look at the website and read about it! I think you will end up there! !